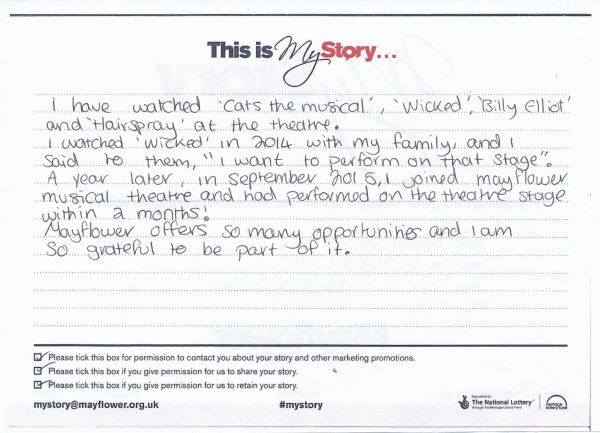 My Story card: Kaitlin Gale remembers seeing many musicals, joining MMYT and performing on Mayflower Theatre's stage. I have watched 'Cats the Musical', 'Wicked', 'Billy Elliot' and 'Hairspray' at the theatre. I watched 'Wicked' in 2014 with my family, and I said to them, "I want to perform on that stage". A year later, in September 2015, I joined Mayflower Musical Theatre and had performed on the theatre stage within a months! Mayflower offers so many opportunities and I am so grateful to be part of it.